It was at around 3pm that I found myself hiding in a park washroom, balancing awkwardly on one foot with the other raised to get my toes as close as I could get to the hand dryer’s blast of warm air. The temperature was somewhere in the -10 range, a day of icy cold sandwiched between two days of even more extreme icy cold. It was also the Morningside Park natural ice rink party put on by Centennial College’s Environmental Students Society (who created and maintain the rink), so here I was attempting to thaw my toes under a hand dryer and get up the courage to put on skates after an eight year hiatus. Skating is not my favourite thing. In fact, as a West Coaster, winter isn’t really my favourite thing. I hate wearing layers that have their own layers. My fingers and toes have such poor circulation that they inevitably end up white and rubbery. I don’t enjoy having each word I utter freeze as soon as it leaves my mouth and clatter to the ground. But I have lived in Toronto for almost five years now (damn all you Vancouver friends posting your pictures of flowers blooming in February and walking around in your cotton zip-up hoodies), and here, in Toronto, winter is a thing and skating is one of those things that make this thing a tolerably thing for many, even an enjoyable thing. So: a natural ice rink party on Valentine’s Day. Why not. Morningside Park is a huge park. I was told there were deer and coyotes. I was told to come back and go for walks when it was warmer. The ice rink was built in a clearing near the playground and a BBQ structure. Campfires had been set up and people huddled around them, sometimes talking, but more often than not just silently appreciating the warmth. The rink itself wasn’t huge, but it was impressively manicured. People with big shovels would zip around every once and awhile, clearing the powdery snow that had been created from so many skates slicing around its surface. I was happy to see that many people seemed to be beginners. Metal folding chairs were clung to as people gingerly moved around the ice. The exception was one older couple zipping around, holding hands, parting only to pass by slower skaters, and a child who propelled himself forward with a crazy never-ending fearless energy. I decided I would skate a little bit later. First I ate food, which had been prepared and brought by Lick’s and served assembly-line style under the BBQ hut. My burger and its toppings were cold, but then everything was. I sat down at a table to eat and noticed that a bottle of water left out was now mostly ice. I can’t remember the last time I skated. I think it was in Vancouver on the rink underneath Robson Square. Although I took skating lessons as a child, it wasn’t something I kept up as I grew older, abandoned just like the piano, swimming, soccer, and baseball lessons. In Vancouver, skating is not the activity that it is in Toronto. Outdoor rinks are a rare species there. I can only think of the one at Robson Square. But here in Toronto they are everywhere. If they are not artificial rinks maintained by the City, they are natural ice rinks created and maintained by community volunteers for the enjoyment of all. It’s a hard job that takes dedication and a set of winter chops that I don’t possess and likely never will. Getting up at midnight to go flood the rink so the kids can skate the next day? No thank you, my bed is warm and the book I’m reading is too good. But I’m glad these people did. After discovering the heated washroom and defrosting my toes, I felt reinvigorated and marched straight to the table where skates could be borrowed free of charge, picked out a set of size elevens and, with much difficulty, laced them up. I stood, wobbling, my ankles knocking back and forth. I had a short walk down a snowy pathway to the ice rink and almost fell a hundred times, but I finally made it. 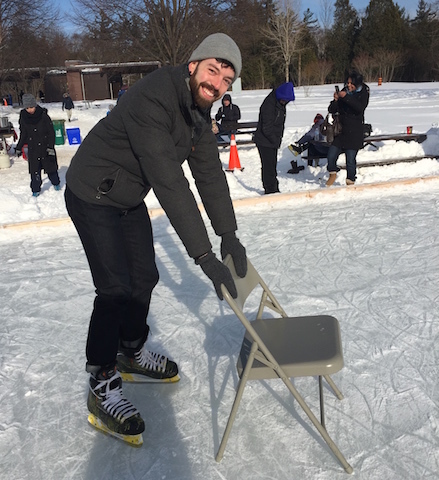 My friend and coworker Minaz kindly fetched me a metal chair to grip as I stepped onto the ice. I hear it’s just like riding a bike, Minaz said. This would be true if the bike was instead two sharpened blades that you strapped to your feet before stepping out onto a frozen surface. I made my way halfway down the rink, bent over and clutched the metal chair like how I imagine the cave people did when they went skating for the first time. Then, like evolution teaches us, I straightened up, stood tall, and let go of the chair. “Can I take this?” someone immediately asked. I nodded, gulping. My chair was gone. I pinwheeled my arms once for good measure and set off, chairless, across the ice. One thing I had forgotten about ice skating was how much it burns. What a thigh work out. I made my way around a few times, keeping my eye trained on the older couple whizzing around so I wouldn’t collide with them. They effortlessly parted around me like water around a very wobbly and uncertain stone. I think I made about seven loops. Amazingly, I didn’t fall. I felt ridiculously proud of myself. All around me were students, kids, and adults, many of them out on the ice for the first time, learning to do this strange activity with a smile on their face. Back in my boots, a man handed me a cup of hot apple cider which was bubbling away on a picnic table. Another man handed me a cookie from a tin. This was, simply put, the best. Earlier, while hiding out in the warmth of the washroom and trying to work up the courage to skate, a young guy had entered, maybe 24 years old. “Are you going to stake,” he asked. I nodded. “I think so. I haven’t been in over eight years though,” I said. “I haven’t been in my whole life,” he replied. Later I had passed him on the rink. His hand gripped the girl’s next to him as they shuffled down the ice, laughing. Hi Jake, it was nice to see you on Saturday, briefly. I’m glad that you and Minaz had a chance to skate. I returned last night to skate for and hour and helped shovel off the ice. The Centennial College volunteers had shown up to flood and resurface the ice after all of the use the rink had this weekend. I really like your skating story and your City within a Park Project. Can I link to your post for our Connect with the Creek Project? The Highland Creek Green Team collects stories about parks, nature, and environmental initiatives in the Highland Creek watershed at http://www.highlandcreekconnect.ca. 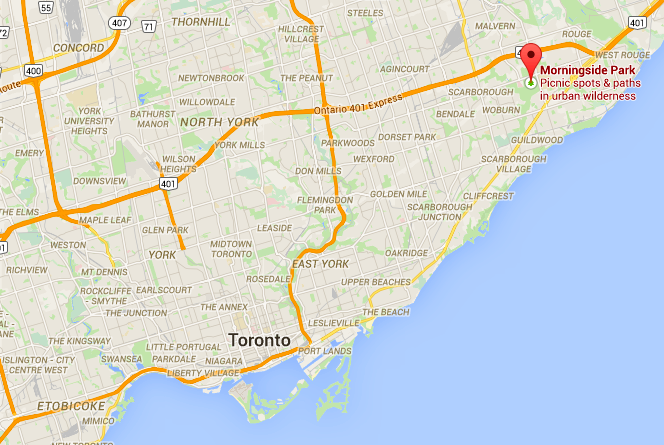 I will keep my eye out for other posts about parks in the Scarborough wards as well! We’ll have projects going on in Wards 39, 41, and 38 this year, so we’ll probably see you again. Hi Cass. Great to see you as well. Please feel free to link and share as you like! It was a pleasure meeting you and a real privilige holding the Family Skate Day. I am glad you had some memorable moments from your visit to Morningside Park. We are really overwhelmed by the response to the Outdoor Ice Rink Project. We hope the ESS’s mission of enviornmental sustainability, education and awareness has been delivered positively to the neighborhood through this exciting and fun filled Winter Community Outreach. Thanks for sharing your story with us. Your pictures add colour to your writing! Hope to see you again on Feb 21st at the rink! !